I will start off today with a few words about Boston. We have been running this site for approximately six years now and there have been plenty of significant events/tragedies that we have not really talked about in this space for a variety of reasons, but this one hit closer to home for the primary reason that Boston was actually our home (at least for one of the two of us that run this site) for 11 years. I have not been back since leaving at the end of June for a new job, but was already planning on doing so this coming June well before the tragedy that transpired yesterday. I just want to send my condolences to those who lost loved ones yesterday and wish for a speedy recovery for all of those who were injured. We knew it was coming, but yesterday Nerlens Noel made it official that he would be entering the NBA Draft. Some pundits may argue that Noel should spend an extra year in college to rehab from a torn left ACL, but we do not see the benefit. Noel, who was considered by many to be the #1 pick before he tore his ACL, is still considered a potential #1 overall pick depending on which team gets that pick. As crazy as it sounds the potential #1 overall pick in this year’s NBA Draft might get overshadowed on next year’s Kentucky team particularly if he is not 100% when he returns. There have not been many cases where an underclassman leaves early with such a significant injury, but these are exceptional circumstances. Plenty of people have mocked the NCAA’s new academic standards, but for many recruits those numbers can be hard to meet, which has led to a rise in the number of recruits who pursue alternative routes to college including junior college. As the article points out New York City only produced one Division I men’s basketball player who was academically eligible and the standards are about to get tougher. As John Infante points out the new standards will also alter the calculus of eligibility for players who do not go straight from high school to Division I basketball. This might seem like a small story now, but it could become a big issue once the new standards go into effect. Last season the Missouri Valley Conference was one of the best conferences in the country, but after it was announced that Creighton would be leaving we knew they were set for a downgrade. Yesterday we found out it would be a big downgrade as it was announced that Loyola (IL) would be replacing Creighton. Nothing against Loyola, which appears to be making attempts at improving its program by upgrading its facilities and hiring new coaches (unfortunately we are more familiar with their women’s coach than their men’s coach), but going from one of the top “mid-major” teams in the country to a 5-11 Horizon League team is a huge drop-off. Now the conference still has its fair share of heavyweights, but with this type of replacement we would not be surprised to see some other conferences try to poach some of the Missouri Valley Conference’s top programs. One of the few bright spots for Purdue last season was how young they were. Their fans could ignore their 8-10 Big Ten record as merely growing pains for an extremely young team. They can still have those hopes, but while they maintain their top underclassmen the Boilermakers have been losing quite a bit of their supporting cast with the most recent departure being Anthony Johnson who asked for and was granted a release by the school. Johnson put up decent numbers as a sophomore (4.9 points and 2.9 rebounds), but shot a putrid 36.2 percent from the floor and was expected to see his minutes decrease with most of the team’s top players returning. The Iowa Hawkeyes were not going to be denied a win on Saturday night as they beat the Wisconsin Badgers, 70-66. There was an emotional feel to Carver-Hawkeye arena as the Hawkeyes honored 1993 captain Chris Street‘s death during halftime. The Hawkeyes built a 16-point lead early in the game and it was too much for the Badgers to recover. Bo Ryan’s team held their first four B1G opponents to 50.5 PPG but Fran McCaffery’s offense put up 70 points as sophomore Aaron White scored 17 points of his own. White was very aggressive by getting to the free throw line and shooting 13-of-15from the charity stripe. Even the best of the freshmen have been known to hit a slump during the heat of the conference season. Michigan State freshman Gary Harris (12.6 PPG) hasn’t been shooting very well lately and head coach Tom Izzo believes that he might have hit the “wall.” During the Spartans’ 59-56 win over Ohio State, Harris shot 0-of-5 to begin the game but pulled himself out of the slump to finish with eight points for the night. Harris made the necessary adjustment at his coach’s urging to attack the basket rather than settle for jumpers as he shot 4-of-5 from the field during the rest of the game. Speaking of the freshman wall, another first-year guard who has had a rough patch lately is Michigan’s Nik Stauskas. Stauskas was shooting over 50% from beyond the arc has made just 3-of-13 attempts from the perimeter over the last three games. 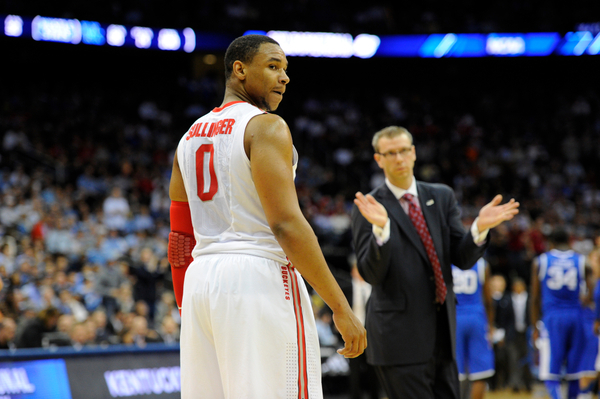 But regardless of his mini-slump, both Stauskas and his coaches are not too concerned at the moment. When asked about Stauskas’ shooting, head coach John Beilein responded, “We will just keep working with him.” Coaches around the conference understand Stauskas’ strengths and have been trying to take his three-point shot away while also making him work on the defensive end to disturb his rhythm. It appears to be working. The Ohio State Buckeyes might not win the Big Ten title this season, but Deshaun Thomas has shown that he is the best scorer that the league as to offer. Thomas scored 28 points during the Buckeyes’ three-point loss in East Lansing over the weekend — that’s 50% of his team’s total points! But if he can get some consistent help from his teammates, they might be good enough to become a top 15 team for rest of the season. Lenzelle Smith had six points to support Thomas, but a couple more buckets by the rest of the supporting cast might have helped the Buckeyes leave town with a great win. Sophomore Shannon Scott has been pushing the ball in transition and is another candidate to step up as a second scorer for Thad Matta. Matt Painter’s Purdue Boilermakers are young but seem to be improving and it showed in their dominant win (79-52) over West Virginia on Saturday. One of the key contributors in the win was redshirt sophomore guard Anthony Johnson, who scored 12 points in just 20 minutes. Painter was impressed by his backup point guard’s performance on both ends of the floor, stating, “Anthony played half of the game and had zero turnovers.” Johnson responded, “Credit to my teammates for giving me the ball in the right positions.” The Boilermakers will continue to be a tough out at Mackey during the next few weeks and can strive to play spoiler in the tough conference race. This is almost certainly not the way John Beilein and Michigan wanted to start a 2012-13 campaign that’s so filled with promise. Because of an unspecified “violation of team standards,” sophomore point guard and preseason All-American Trey Burke will sit out the team’s season debut when it takes on Northern Michigan in an exhibition game Thursday in Ann Arbor. Burke broke the university record for assists in a season last year, but it’ll be freshman Spike Albrecht starting in his place during the one-game suspension and handling the assist duties for the Wolverines. “Trey will sit out the first game as a result of some ‘out of character’ decisions he now regrets,” Beilein said in a statement, according to AnnArbor.com. “We believe he has learned a valuable lesson and we are confident he will grow from this experience.” This does not seem like a situation that will adversely affect the Wolverines’ regular season, but nobody likes to start the season with a distraction like this. If there’s one way to describe Ohio State over the last few years, it may be that less is more. The Buckeyes have been regular Big Ten and national title contenders over the last decade or so, but they’ve never done it with much depth. This year could bring something Buckeye fans aren’t used to. Coach Thad Matta indicated this week that Ohio State will be rotating more players than usual this season, with a possibility for six or seven different lineups. Things did not go off without a hitch in the Buckeyes’ exhibition opener on Tuesday — a 83-71 win over Walsh College — but Matta did tinker with the lineup, sending out a different starting five at the beginning of the game then again after halftime. Ten players saw the floor for Ohio State, and eight played at least 14 minutes. If this stays true to form, that many Matta-recruited top-notch athletes over the course of 40 minutes could give teams fits this year. As for the depth at Minnesota, the Golden Gophers took a hit in advance of their first exhibition game with an injury to freshman Wally Ellenson. According to the Minneapolis Star Tribune, the 6-foot-4 guard broke a bone in the middle finger of his left hand during a rebounding drill this week when it got caught on a teammate’s jersey. Coach Tubby Smith said it was a clean break and it is expected to keep Ellenson out of game action for 6-8 weeks. Now, Smith says, a redshirt could be in order. “He was playing well and he probably wasn’t going to be [redshirted], but it’s going to be something that we’re going to probably consider at this juncture,” Smith said. If you have any doubt that the state of Indiana is basketball mecca, just tune into Big Ten basketball this season to see some of the conference’s brightest young stars who hail from the Hoosier State. It’ll be players like Gary Harris at Michigan State, Glenn Robinson at Michigan and Yogi Ferrell at Indiana who are expected to make an instant impact when they suit up as first-year players. Purdue will also rely on the young talent of in-state talent with Ronnie Johnson on the rise. And that’s just the short list. For some more Indiana-bred talent, check out Michael Pointer’s story from the Indianapolis Star. Or just stay tuned for what ought to be an awesome season of hoops in the Midwest. Evidently, Purdue basketball will be a name game this season. As Jeff Washburn writes, if the Boilermakers’ exhibition opener is any indication, Big Ten fans can get used to hearing about the Johnsons in West Lafayette this winter. Terone Johnson, Anthony Johnson and Ronnie Johnson led the way for Purdue in its 70-61 win against Montevallo on Tuesday night, and those three are expected to be at the forefront all year long. As mentioned earlier, Ronnie is a highly-touted freshman with a big future while Terone and Anthony will also help provide formidable backcourt depth. They combined for 47 of Purdue’s 70 points in the exhibition game. This just in, Damian Lillard is a “BEAST!” Of course, if you follow the conference, you knew that already. Lillard has shown thus far in this young season that the MVP award is his to lose. In the first four games he is averaging 23 points per game. We will just let that sink in for all upcoming Weber State opponents. Are they for real? Montana State has rattled off five straight wins, but the question remains, is it a fluke? Well, they will get their chance to prove it right away. They have upcoming games against Iowa State, Illinois State, UCLA, and they kick off the conference season vs. Weber State. By Christmas we will know whether Bobcat fans are getting something nice or coal in their stockings. Defense wins championships. If that saying holds true, then Montana should feel good about their team. On 11/22 the Grizzlies held Idaho to 12% shooting. Yes that’s right; the Vandals shot 6-50 from the field. Somewhere, coach Wayne Tinkle is smiling. The Wildcats debut at the top spot despite going 2-2 in their first four games. It’s hard to argue with having the two-time defending regular season champs and a team returning the reigning league MVP as the top team here. Last week they kept it respectable on the road against Utah and really should have beaten Utah State on the road. But down the stretch the crazy Aggie fans got the best of their in-state rival. Damian Lillard picked up where he left off last year averaging 23 points per game through the first four games. NBA scouts have already started to salivate at the thought of Lillard in an NBA uniform. NBADraft.net has him as a late first round pick in the 2012 Draft. Look for Lillard and the Wildcats to make some noise in the Great Alaska Shootout on Thanksgiving weekend. If there was a 1a and a 1b in the Power Rankings then the Lumberjacks would be that 1b. This team is loaded with experience. Head coach Mike Adras brings back four starters from last year’s 14-14 squad. They nearly took down Creighton on the road, which is no easy feat by the way. Then they took care of business their last three, topped off with a big road win at Kennesaw State. 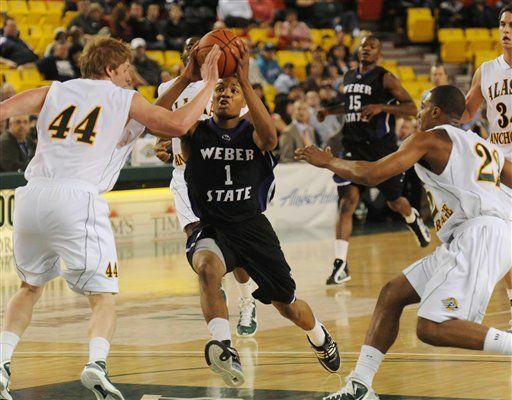 With all the returning experience and the past coaching success of coach Adras, the Lumberjacks will be nipping at Weber State’s heels all year long. With the best season in school history in the rearview mirror, the Bears are looking to capitalize on their program’s momentum. First-year coach B.J. Hill takes over for the departed Tad Boyle who left for Colorado. Don’t look for this team to miss a beat since Hill served for four years under Boyle before taking over this year. However this team lives and dies by Devin Beitzel. He had a solid 20 points in a close loss at Santa Clara but overall is shooting 20.8% from three point range. For the Bears to challenge for a conference title, Beitzel has got to find his stroke. If coach Brad Huse is reading these Power Rankings, feel free to use it as bulletin board material. The “no respect” card should be played after the Bobcats rattled off five wins in a row. Yet this team is still ranked fourth. For them to climb up the rankings they must show they are for real. Beating Big 12 member Iowa State on 11/27 would be a start. The one-two punch of Bobby Howard and Erik Rush is going to be something the rest of the league better take notice of come conference play. The Grizzlies are trying to capitalize on their amazing run through the Big Sky Conference Tournament last year. They of course are also trying to replace Anthony Johnson, the catalyst of their past success. So far, center Brian Qvale has been everything they thought he would be as a senior. With Will Cherry showing his freshman campaign was no fluke, this team will once again have something to say come conference tournament time. Don’t tell these guys that they got nothing to play for. Head coach Tyler Geving has his team playing with a chip on their shoulder this year. The Vikings are not eligible for the postseason, including the Big Sky Conference Tournament. This year they will have to play the role as spoiler, and it’s beginning to look like that might happen more often than others want. The Vikings have a balanced attack with four players averaging in double figures with a fifth close to ten points per game. The trouble for upcoming opponents will be who do they guard? Head coach Kirk Earlywine has the youngest team in the conference this year. Not one senior is on this year’s roster. This has not stopped the young Eagles from showing lots of promise. The question is will this be the year that the youngsters grow up? Big Sky Conference Freshman of the Year Glen Dean has been sidelined thus far with a stress fracture and remains day-to-day. Having Dean back in the lineup is most certainly the key to the Eagles season. The first question that comes to mind if you are an opposing coach of Idaho State would be where is Broderick Gilchrest? The man went unconscious at Colorado for a career high 39 points. The following game he was held to four points on one-of-nine shooting from the field at Arizona. As the conference season gets underway, coach Joe O’Brien will have to find a way to get Gilchrest open looks. As for the schedule, it doesn’t get any easier. Six of their next eight games are on the road. This has to be the most encouraging last place conference team in the nation. Brian Katz knew what he was getting into when he took over the Hornets coaching job. In the last three seasons this team has won a total of fifteen games, with last year contributing nine of those. Katz has only three players returning from last year that contributed. But as with any rebuilding project, to get over the hump, you’ve got to learn how to win close games. In their three losses, they have lost by a total of thirteen points. Once this team learns how to win the close ones, they could surprise some people. Northern Colorado is going to Vegas, baby! The Las Vegas Invitational to be exact. The Bears will take on Valparaiso on 11/26 and either Bethune-Cookman or Texas A&M Corpus Christi on 11/27. This tournament includes such national powers such as Kansas and Arizona. It should be a great experience and atmosphere for B.J. Hill’s club. Expansion talk! The Big Sky is not waiting on the big boys to make a move. Being proactive, earlier this month the league added North Dakota and Southern Utah as full members. The move puts the league at eleven teams in basketball. Who will be the twelfth? Rumor has it South Dakota is interested. BracketBusters will feature all nine members of the Big Sky Conference. Fans can watch their favorite Big Sky team on one of the ESPN family of networks 2/18-2/20. This is the first time that all members of the conference will participate in a given year. Is there anyone else in the league that we should give this to? We didn’t think so either. Damian Lillard, let the love fest begin! A man among boys, this 6’2 junior guard from Oakland, California has started off the season with a flurry. The reigning Big Sky Conference MVP is up to his old tricks again averaging 23 points per game through four. If it pleases the court, I would like to enter into evidence “Exhibit A” (below). After a heavy helping of threes to the face, Damian decides to take it to the hoop “nasty style” at the 1:28 mark. Is there any doubt why he wears number 1? Greetings, everyone, from beautiful San Jose, California. It’s a 75-degree outside the building, but nobody cares about that because it’s time for March Madness, and already across the country today, the games have been insane. Is there any other sporting event in the world that is so consistently awesome on a year-to-year basis? I’m going to be updating this diary by the half so as to accord with NCAA policies. Let me know if you have anything you’d like to know in the comments. What a crazy early afternoon of games so far – are you kidding me? Two games in OT and a third down to a last-second shot that missed? The one thing that I can’t believe the NCAA doesn’t mandate is at least a running scoreboard to keep the fans here abreast of other games. Because that’s all anyone wants to know about right now is what’s going on in the Villanova – Robert Morris game. Vandy is more athletic than you might think, but Murray is right there with them, jump for jump. The only real advantage I see Vandy having is a little more size and length inside with 6’11 pair of AJ Ogilvy and Festus Ezeli. This Murray team has the look of a team that won 30 games this year. They have a swagger and confidence that they belong here and have shown no sense of intimidation against their SEC foes. There’s a regional rivalry at play here too, as Murray is located squarely in SEC country and surely gets their fill of talk about Kentucky, Vandy and so forth. Murray State forward #43 Tony Easley acts as cheerleader/coach when he’s not on the floor, encouraging his teammates, getting in their ears, and greeting them as the first one off the bench during timeouts. I love seeing that. Every team needs at least one of those players to keep his teammates honest. 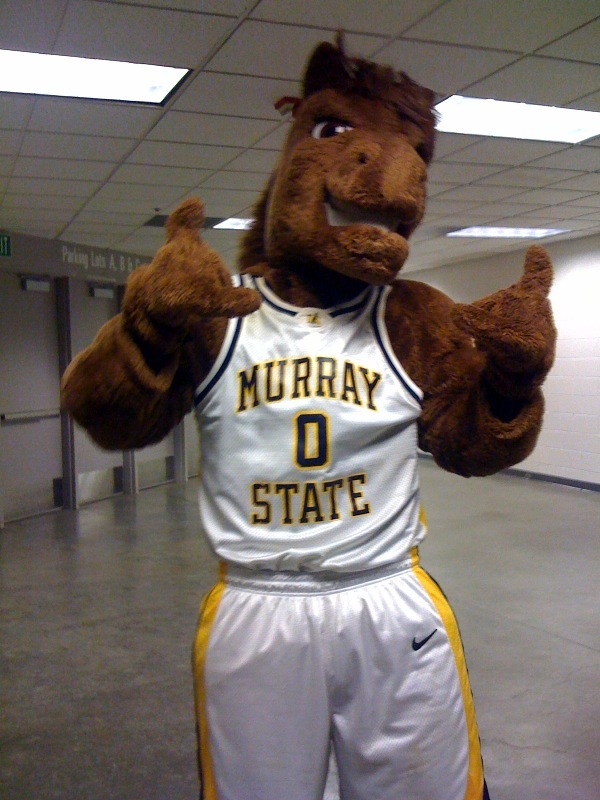 Gotta love March Madness when an upset is brewing… the buzz in the room just turns on like a switch, and suddenly 90% of the arena starts looking to buy Murray State t-shirts and caps. In keeping with the style of play of both Murray and Vanderbilt, a lot of players saw action and put up points in the first half. Murray was led by the electric little guard BJ Jenkins with 9 pts and Vandy by Jeffery Taylor also with 9 pts. AJ Ogilvy has been largely unheard from in the game (2 pts, 1 reb). President Barack Obama picked Kentucky to lose in his bracket’s final game but Coach John Calipari is worried about just getting momentum. “Land the plane. Survive and advance,” Calipari told Chris Low of ESPN. “That’s all we’re thinking about. We’re not worried about the score and who scores and what. Just land the plane and move on.” To that end, East Tennessee State lost by ten to Pitt last year as a #16 seed in the first round. Can they be the first to pull off the historic upset? Perhaps both Texas and Wake Forest should just throw out their recent struggles. Temple is only favored by 4 points over Cornell. Meanwhile Lafayette head coach Fran O’Hanlon has worked with both coaches and is rooting for both. Would professors at Wofford dare to not pick the Terriers over Wisconsin in their office pool? And apparently message boards hounded Badger junior Tim Jarmusz earlier this season as he moved from starting forward to coming off the bench. Washington’s Isaiah Thomas has a broken bone in his shooting hand, which is why he wears a glove. Last year Marquette’s players shaved their heads in solidarity, but this time they got a different haircut. New Mexico’s Darington Hobson is predicting a run to the regional finals. Meanwhile the New York Times has a great profile on Montana’s Anthony Johnson. Is this Mike Anderson’s best coaching job at Missouri? West Virginia is looking to beat Morgan State after losing to Dayton as a #6 seed last year.